Dive watches are incredibly popular because you can trust that they won't easily dent, scratch, or break. Dive watches are meant to withstand the elements, so they're perfect for professional divers or adventurers. There is also a growing population of "desk divers:" men who love the look of dive watches however do not require the dive watch features in their day-to-day life. No matter why you buy a dive watch (whether for practical or aesthetic reasons), you can be sure that these dive watches will satisfy. There are a few characteristics that you'll find in the majority of dive watches, including water resistance, a unidirectional bezel, a highly legible dial with luminescent hands and indices, and a screw-down crown and case back. If you're unfamiliar with a unidirectional bezel, it's a bezel that can only rotate counter-clockwise. This helps divers to time their remaining air supply. However, if they accidentally knock the bezel by mistake, it can only move in the direction that would err on the side of safety, preventing divers from overestimating their remaining air supply. We've compiled our favorite dive watches under 1,000 dollars, under 5,000 dollars, and under 10,000 dollars. We're here to help you find the perfect dive watch, no matter your budget. Let a comment below if you have any questions! First on our list of the best dive watches is the Seiko Prospex Sea. This collection of watches is by no means Seiko’s first venture into dive watches. The first Seiko dive watch, the automatic 150m Diver’s, was introduced in 1965. But it was the Seiko Professional Diver 600m watch that changed the world’s standards for dive watches. Over the past fifty years, Seiko has improved, refined, and updated their dive watches. Today, Seiko Prospex has a line of watches dedicated for professional divers. The majority of these watches are water resistant up to 200 meters (20 bar) and are suitable for scuba diving. These dive watches also feature a screw-down crown and case back, heavy-duty straps, and luminescent hands and numerals. Seiko Prospex watches range from $375 to $795. The Citizen Eco-Drive Promaster Diver also makes the cut for one of the best dive watches under 1,000 dollars. With a solidly built case, luminescent hands and indices, long-term power reserve, and unidirectional rotating bezel, this dive watch is sure to satisfy professional divers. Another benefit of this Citizen dive watch is that you won’t have to change the battery or remember to wind the crown. This watch is powered by Citizen’s Eco-Drive movement, meaning that this watch is solar-powered. The watch will automatically charge the battery whenever it’s exposed to light (both natural and artificial light). The watches in the Citizen Eco-Drive Promaster Diver collection come with a variety of different water resistance levels. Citizen Promaster Diver watches range from $295 to $795. Deep Blue may not be as recognizable as Seiko or Citizen, but that does not mean they don’t produce quality dive watches. Because Deep Blue specializes in dive watches, they have the process of creating professional dive watches down to a science. Although you can’t go wrong with any of their dive watches, we recommend the Master 2000. The Master 2000 features a unidirectional bezel, luminescent hands and indices, a sturdy case, a helium release valve, and a 2000 meter water resistance. This watch also features a sapphire crystal case, which is a scratch-resistant dial unlike mineral dials. Deep Blue Master 2000 watches range from $899 to $999. If this is out of your budget, we recommend checking out the NATO Diver 300m, which is priced under $300. The Orient Mako has been one of Orient's most popular collections, and there’s a good reason why. The Orient Mako is an affordable mechanical dive watch that is reliable and stylish. Now Orient has introduced the Mako II to build on the Mako legacy. The Mako II features a more robust movement, the Caliber F6922. Plus, the unidirectional bezel now is more precise with 120 clicks, and the watch is water resistant up to 200m. These changes have enhanced the Mako dive watch without losing the brand’s signature style. Orient Mako II watches are priced at $325. Many dive watches have a sporty style with large numerals, thick hands, and a sturdy case. The Victorinox Maverick Mechanical refines the classic dive watch style, making it easier to wear their dive watches as everyday watches. Victorinox aims to make versatile dive watches that can be worn in the office, in a pool, or in the ocean. Victorinox watches may look dressier, but that doesn’t mean they can’t withstand the elements. The Victorinox Maverick Mechanical watch features a unidirectional rotating bezel, a screw-in case back, a scratch-resistant sapphire crystal cover, and a sturdy stainless steel case. The watch is water resistant up to 100m. The Victorinox Maverick Mechanical watch is priced at $895. If you’re a fan of vintage watches, then the Oris Divers Sixty-Five is the perfect dive watch for you. The Oris Divers Sixty-Five’s retro design and bubble-curved glass was inspired by the brand’s iconic 1965 dive watch. However, the new Oris watch has been modernized with 21st century watchmaking techniques. As previously mentioned, the Oris Divers Sixty-Five features a vintage-inspired bubble-curved glass, which is made of sapphire crystal. The sapphire crystal is scratch resistant, so you won’t have to worry about accidental nicks and bumps. This Oris dive watch features 100m water resistance, luminescent hands and indices, and a screwed-in crown and case back. The Oris Divers Sixty-Five watches range from $1,950 to $2,150. The Tudor Pelagos has earned its spot on our list of the best dive watches under 5,000. Of course the Tudor Pelagos features all of the standard dive watch features: unidirectional rotating bezel, luminous hands and indices, and a sturdy titanium case and bracelet. However, Tudor takes this dive watch one step further with a 500 meter water resistance and a helium escape valve. Plus, the titanium bracelet is fitted with a steel folding clasp that includes a unique auto-adjustable spring mechanism. This mechanism will allow you to easily adjust the bracelet during the dive, and this is useful since watch bracelets naturally contract when compressed at great depths and expand during the return to the surface. This dive watch is also a great option for left-handed people since Tudor has manufactured a left-handed version in which the crown appears on the opposite side of the case. The Tudor Pelagos is priced at $4,400. The Alpina Seastrong Diver 300 Automatic was introduced at Baselworld 2016. This dive watch offers a cushion shaped stainless steel case, and the watch is water resistant up to 300 meters. The watch features a screw-down crown and case back, a unidirectional rotating bezel, and luminescent hands and indices for ultimate readability. The watch dial is covered by a scratch-resistant sapphire crystal. Unlike many of the watches on this list, the Alpina Seastrong Diver 300 Automatic watch comes with a see-through case back, so you can see the inner workings of the Alpina AL-525 automatic caliber. The Alpina Seastrong Diver 300 Automatic watches range from $1,395 to $1,495. Breitling is best known for their pilot watches, but that doesn’t mean they don’t create a show-stopping dive watch. The Breitling Superocean Heritage is modeled after the brand’s legendary 1950s dive watch, and today it’s available in two sizes: 42mm and 46mm. This Breitling dive watch features a water resistance up to 200 meters, a screwed-in case back and crown, and a unidirectional rotating bezel. When purchasing this watch, buyers have the option of a leather strap, a rubber strap, or a metal bracelet. The Breitling Superocean Heritage watches range from $4,000 to $5,000. The TAG Heuer Aquaracer 300m Automatic is one of TAG Heuer’s most popular models. The Aquaracer features luminescent hands and indices, a scratch-resistant sapphire crystal cover, and a screwed-in crown and case back. Plus, this watch is water resistant up to 300 meters, making this a great watch to take with you scuba diving. The stainless steel bracelet on this TAG Heuer dive watch comes with a folding clasp with safety push-buttons and a diving extension. The TAG Heuer Aquaracer 300m Automatic watches range from $2,400 to $2,550. When you think of a luxury dive watch, the first one to come to mind is often the Omega Seamaster. With the first models introduced in 2005, the Seamaster Planet Ocean collection is a rather new collection for Omega. However, these dive watches have taken the world by storm with their superior quality and design. Similar to other dive watches, the Omega Seamaster includes luminescent hands and indices. However, Omega takes it one step further: the applied indices, hour hand, and seconds hand are coated with Super-LumiNova that emits a blue light and the minute hand and 12 o’clock dot on the bezel are coated with Super-LumiNova that emits a green light. This will make it easier for divers to keep track of their time underwater. The Omega Seamaster Planet Ocean 600m steel and titanium models range from $6,450 to $8,800. Blancpain has established their collection of dive watches as some of the best in the world. The Fifty Fathoms collection was first introduced in 1953, and the brand has continued to refine and develop their iconic dive watch collection. Today there are many different dive watches available in Blancpain’s Fifty Fathoms collection, but we recommend checking out the Blancpain Fifty Fathoms Bathyscaphe. The Bathyscaphe features a sporty design that won’t go out of style, and worn with the right strap, this dive watch can easily be dressed up for a night out. This dive watch features a unidirectional steel bezel, a 300 meter water resistance, a sapphire crystal dial and back, and a 120-hour power reserve. Buyers can choose between a sail-canvas strap, a NATO strap, or a metal bracelet. Blancpain Fifty Fathoms Bathyscaphe watches are price around $10,000. You may have noticed that Breitling made our list for both the best dive watches under 5000 dollars and the best dive watches under 10,000 dollars. We simply couldn’t decide which Breitling model to feature! Hopefully you don’t mind a little extra Breitling love. This Breitling Avenger II is typically regarded as a pilots watch; however, it can also be worn as a dive watch, making it a double-duty watch. Not many dive watches include a chronograph, so this watch is perfect for men who don't want to settle between a pilots watch and a dive watch. The watch is water resistant up to 300 meters, and the titanium case and sapphire crystal cover will stand up to bumps and nicks. This dive watch features screwed-in pushpiece guards, a unidirectional rotating bezel, and a screwed-in crown and case back. Buyers can choose between a leather strap, a steel bracelet, or a rubber dive strap. The Breitling Avenger II watches range between $5,335 and $5,835. Panerai is known for creating bold, thick, sporty watches, and this Panerai Luminor Submersible 1950 3 Days Automatic is no different. This dive watch features a water resistance up to 300 meters, a 3-day power reserve, a unidirectional bezel, and a lever device to protect the winding crown. Panerai is also known for their easy-to-read dials. The white hands and indices on this Panerai Luminor Submersible 1950 are highly legible against the black dial. And when you’re in complete darkness, you’ll easily be able to read the time because of the applied luminescence. This stainless steel Panerai Luminor Submersible 1950 3 Days Automatic is priced at $8,700. This list of the best dive watches wouldn’t be complete without a Rolex! Instead of choosing the ever-popular Rolex Submariner, we opted to go with the Rolex Sea-Dweller. The Rolex Sea-Dweller is an ultra-resistant dive watch that is waterproof up to 1,220 meters. The model offers a unidirectional rotating bezel, a scratch-resistant sapphire crystal cover, and a helium escape valve. The winding crown is protected with Rolex’s Triplock triple waterproofness system. The black dial features large Chromalight hour markers and hands, filled with a luminescent material that emits a blue glow for up to eight hours. This blue glow makes the time visible even in the darkest environments. 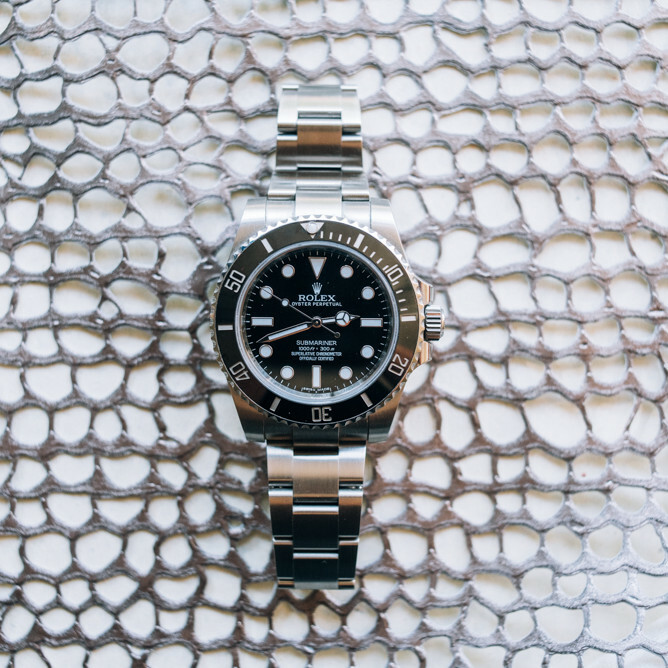 At 11,350 dollars, this stainless steel Rolex Sea-Dweller comes in slightly over our 10,000 dollar budget. However, we simply couldn’t leave off the iconic Rolex Sea-Dweller. We hope you'll forgive us.